Three Wise Color Monkeys Sketch. After completing the InkTober challenge where I spent everyday completing at least one digital ink artwork, I feel I really need to keep my hand in on the traditional art too. Partly as an excuse not to be staring at a monitor for some of my day but also because the traditional art I create has a very different look to my digital art. My plan is to start creating acrylic paintings on canvas again, to sell through ebay, like I used to around ten years ago. As with then, I'll make videos documenting each artwork's creation which you'll find on my The Extraordinary Tourist YouTube channel. This time I plan to make diary videos tracking the progress of the artwork. Once the artwork is finished I'll edit together a 'highlights' video so that people who aren't following the diary videos can get the abridged version all in one shot. As well as selling the original artwork I will make prints available through each of my online stores including RedBubble, CafePress and etourist Skateboards. 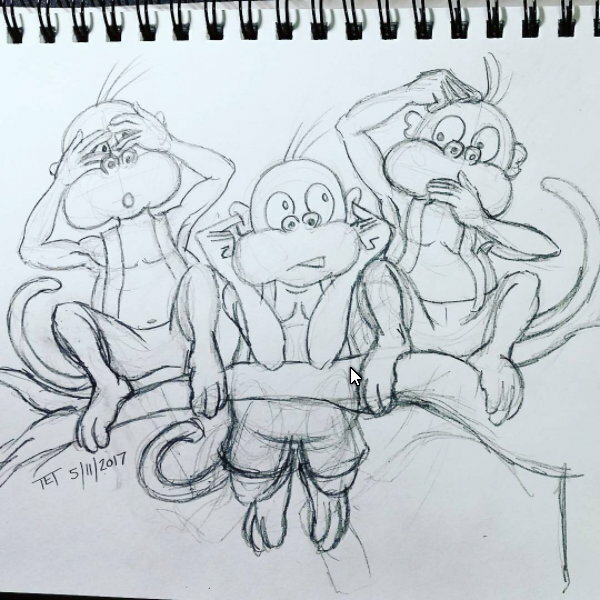 As you can see in the sketch above my first artwork is a depiction of my color monkeys in the classic 'Three Wise Monkeys' pose. 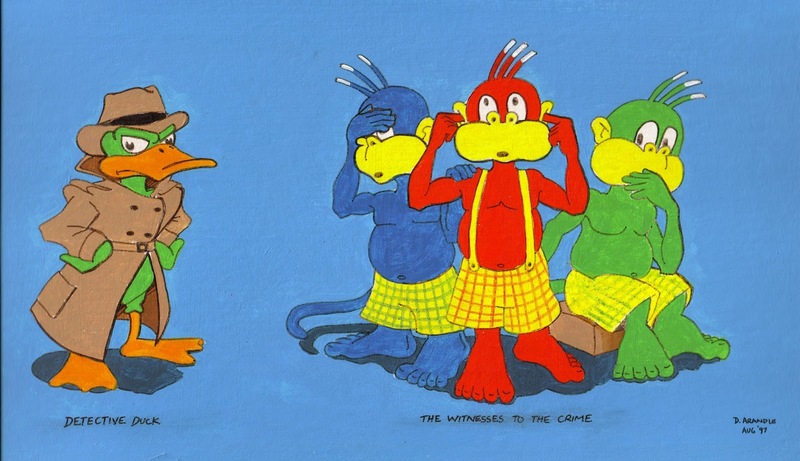 I have painted them in this pose before but, since the monkeys have been partially redesigned, and that was a much smaller painting featuring my Detective Duck character, another version would be a good place to start. The sketch above is the first time I've actually drawn in a physical sketch book since May of this year - which gives you some indication of how often I work traditionally these days. 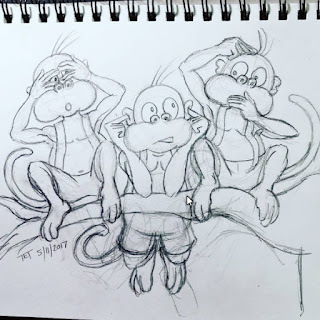 It took about an hour and a half to complete, which is a little long for me, but I was having some trouble finding a good pose for the middle monkey's legs (which I'm still not happy with). I erased them a few times trying to find something that looked right. That's it for now. The next stage will be to transfer the design onto canvas and start painting my under painting. If you'd like to follow the artworks progress but blog posts and video diaries aren't for you, I'll also be posting work in progress photos to my Instagram. So be sure to stop by there and follow me for the latest images.